Since our beginnings on Leith Street in Edinburgh over 180 years ago, we have been working together for an equal and better future for all deaf* people. We are proud to have been at the forefront of many major achievements – in fact we were the first formally constituted deaf organisation in the UK. We have always kept our values; respect, achievement, equality and transparency at the heart of our organisation. The many services and opportunities we have provided over the years, from our workshop on Albany Street in 1929 to our current Children in Need funded youth group for young deaf* people, all play a part in furthering our values and mission. 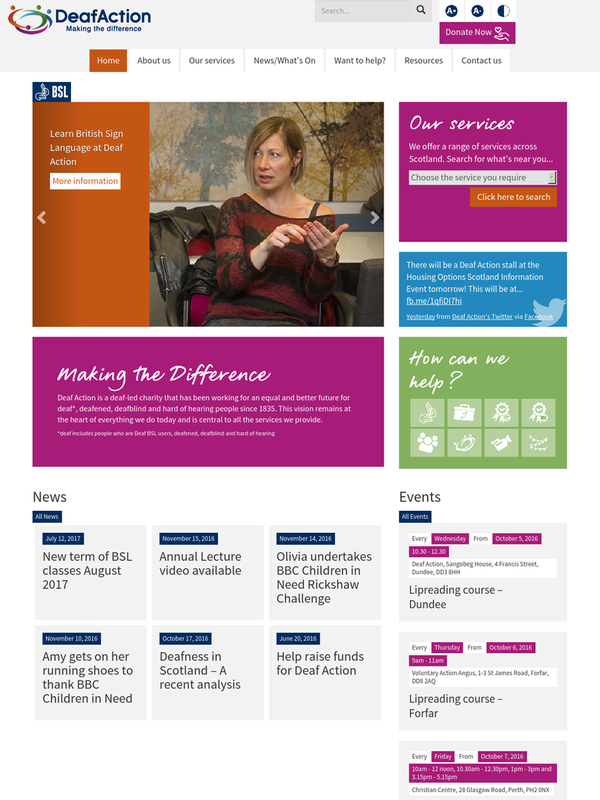 Today, Deaf Action delivers a range of services to the estimated 950,000 people in Scotland with sensory support needs, including those who are blind, partially sighted, deaf, deafblind and hard of hearing. As part of a Scottish Government funded project we are establishing a benchmark for future dual sensory loss services in Scotland.